Owner//Driver spotted one very unique old banger recently, and caught up with the owner to find out more about it. 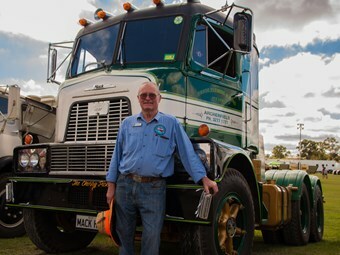 Rodney Sims and his pride and joy, an immaculately restored Mack H67. At the Rocklea Heritage Truck Show this year we came across Rodney Sims and his beautifully restored Mack H67 COE, a model commonly known as a ‘Cherry Picker’ due to its 2.7 metre cab height. This also happens to be one of the two first H67’s brought to Australia and the last remaining right-hand-drive – although there are a few recently imported left-hand-drive models in Rockhampton. Rodney purchased the truck with his wife Janette back in 2015 off Frank Fleming & Sons Pty Ltd, who had painstakingly restored the old Mack. The truck was originally brought to Australia by Anthill Roger & Co in 1962, and these were the first ever cab-over Mack trucks in Australia. Another first was the Mack Thermodyne ENDT-673 engine, which was the first turbo-charged variant made by the manufacturer. After changing hands a couple of times, the truck was purchased by Frank Fleming & Sons Pty Ltd in 1966 with a modest 700,000 miles on the clock. The Flemings owned the truck from then until when Rodney purchased it, which was in part thanks to his fond memories driving it for Frank Fleming & Sons decades ago. "I’d driven this truck and so had my brother, pulling a low loader, about 20 years ago," Rodney explains. "We knew the history of it, we knew the family,"
When it was converted to right hand drive, the Flemings did the conversion themselves and it wasn’t free of design obstacles. The turbocharger had to be relocated, an air-operated clutch had to be retrofitted, the cooling system modified and the steering box turned upside down. Despite this, the truck hasn’t missed a beat and it served Frank Fleming & Sons as a reliable workhorse until it was retired in the mid 1980’s. Rodney gets this truck out and about as much as he can and while it might not be the quickest banger on the road, he couldn’t be happier with it. "It’s a slow old truck, but I enjoy driving it," he says proudly.